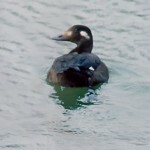 Description: Shiny green-black head lacking a crest, black mantle, white breast and sides. Reddish bill. Female, crested chestnut head, reddish bill, white chin patch and breast, gray body. 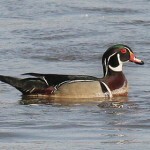 Regular spring and fall migrant across the state. Overwinters if open water is available. Birds will summer in west. Breeding in Nebraska is rare. Behavior: This bird will dive and pursue its prey underwater with its hooked, serrated bill. 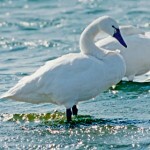 Habitat: Migrants and overwintering birds are found on any large water body with a decent population of fish. Breeding occurs on lakes and ponds surrounded by forest. Prefer lakes and ponds to be by a river. Where in Nebraska: Regular spring and fall migrant across the state. Overwinters if open water is available. Birds will summer in west. Breeding in Nebraska is rare. 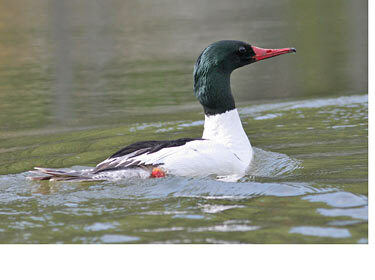 Fun Facts: Gulls often wait for Common Mergansers to surface with a fish and then they try to steal their catch.